Dan Hughes will be giving a keynote address and running workshops at the 3rd JUCONI International Conference in Puebla, Mexico this autumn/fall. The event is to be held over three days, from Thursday 30th October to Saturday 1st November and features almost 30 speakers. JUCONI has worked for 25 years in developing and sharing therapeutic programs for street-involved or excluded children and families throughout the developing world. Poorly resourced organizations throughout the world attend this conference to learn therapeutic ways of assisting marginalized children and families who are victimized by violence. 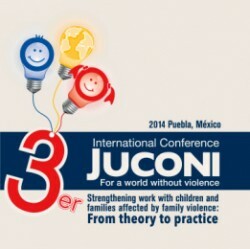 The program for the 3rd JUCONI International Conference – For a World Without Violence has been designed to provide a wide variety of talks, workshops, and discussions led by internationally renowned experts where participants can discuss and learn about methods, techniques, and tools for helping marginalized children, adolescents, and families affected by violence. The key themes of the conference are: the neuroscience of violence and trauma, prevention of violence and trauma; working at an individual level, group level and with families, as well as community approaches. Dan is very excited about sharing his expertise and experience at this international conference, “It is an honor to be asked to bring our knowledge of DDP to these communities”. More information about the conference can be found on 3rd JUCONI International Conference website. Watch a video from 2012’s conference summarizing the first day’s proceedings, to find out more about the previous event.